Over a year ago now, I went to a meringue kisses masterclass with the Meringue Girls in East London (which I reviewed here). The evening was fantastic and we experimented with lots of different colours and flavours like maple & pecan not to mention zesty lemon and lime. Since the class I’ve made meringue kisses a few times, but none as cute or adorable as these Christmas Elf Kisses! This recipe is so incredibly simple that you can easily make them with children. 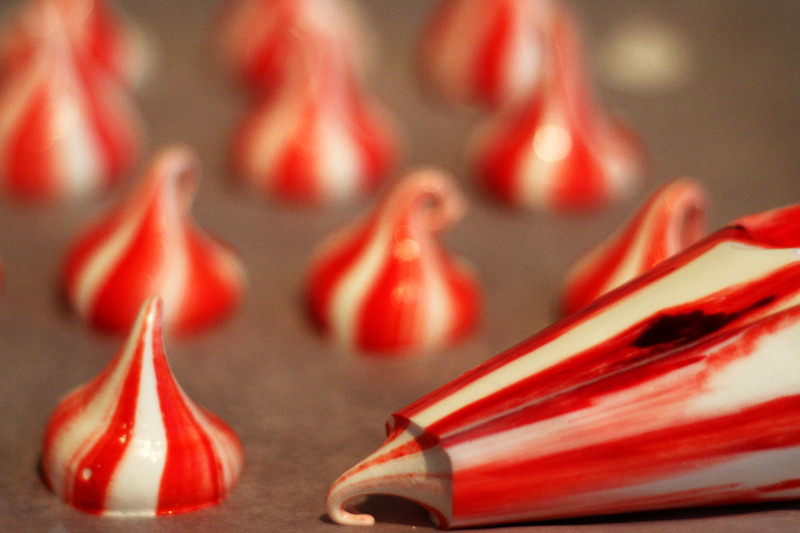 If you follow just a few key principles you’ll have perfect meringue kisses every time. Before you start making your meringue kisses, make sure that all of your equipment is clean and dry. Of course we all wash up our bowls and whisks before we use them but its essential that there is no grease or oil on any of your equipment otherwise this will stop the meringues forming stiff peaks! Whilst most recipes will call for exact amounts (for example my recipe says 150g egg whites), don’t panic if yours come to 175g. There’s no way you’re going to be able to remove 25g of egg whites from your bowl and you don’t need to. To make meringues you simply need double the amount of sugar to egg whites so if you have 175g egg whites then use 350g sugar instead. Follow this rule and it will work every time. When it comes to flavouring or colouring your meringues, never use liquid flavours or food colours. This will affect the consistency of the meringue. Only add powdered flavours like freeze dried raspberries or cocoa powder. The same applies for colouring. Follow the paintbrush technique with concentrated food colouring and I promise you they won’t go wrong! With those 3 key pieces of advice follow the basic recipe below and you’ll be well on your way to having plenty of Christmas Elf Meringue Kisses for the festive season. 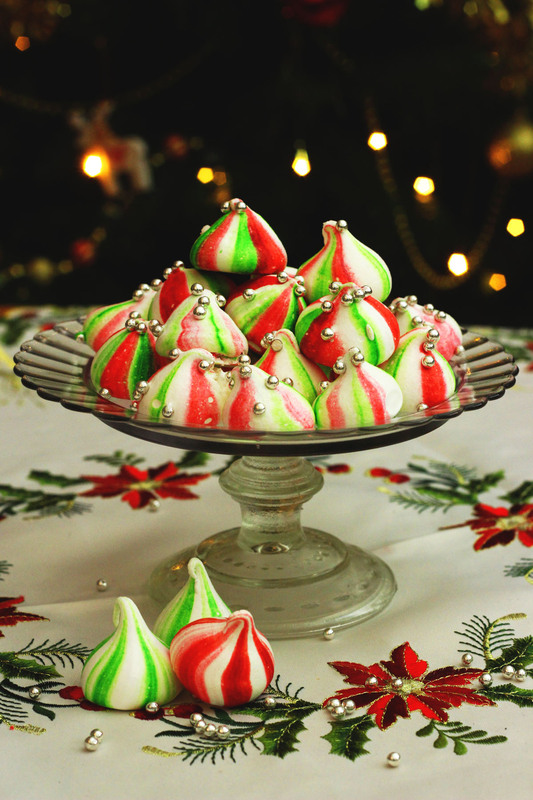 Meringue kisses are given a Christmas makeover with green and red stripes! Top with silver balls for cheeky elf kisses. Place the caster sugar into an oven dish and place into a hot oven (220C/200C) for roughly 5 minutes until the sugar is hot but not yet melted. Take the sugar out of the oven and immediately begin whisking the egg whites in a large bowl. Once the egg whites have formed stiff peaks, turn the whisk speed to maximum and begin adding the warm sugar one spoon at a time. Make sure that the egg whites are forming stiff peaks again before adding in the next spoon full. Once all of the sugar has been added to the mixture, whisk on high for another 5 minutes to ensure the egg whites are thick, firm and glossy. Next, take the two icing bags and paint red and green stripes in each with the food colouring. Fill the piping bags with the meringue and cut a large opening at the bottom of each bag. Pipe a small amount of meringue on to a large baking tray and then line the tray with grease proof paper (the little bit of meringue in each corner will help it stick). Begin piping the meringue kisses in the top left hand corner. Hold the piping bag upright, squeeze gently and lift away as you stop applying pressure. Repeat over and over again until the whole baking sheet is covered and all the meringue used up. Cook the meringues in the centre of the oven for 30-45 minutes at 100C/80C or until the meringue kisses come off of the baking paper without leaving their bottoms behind. 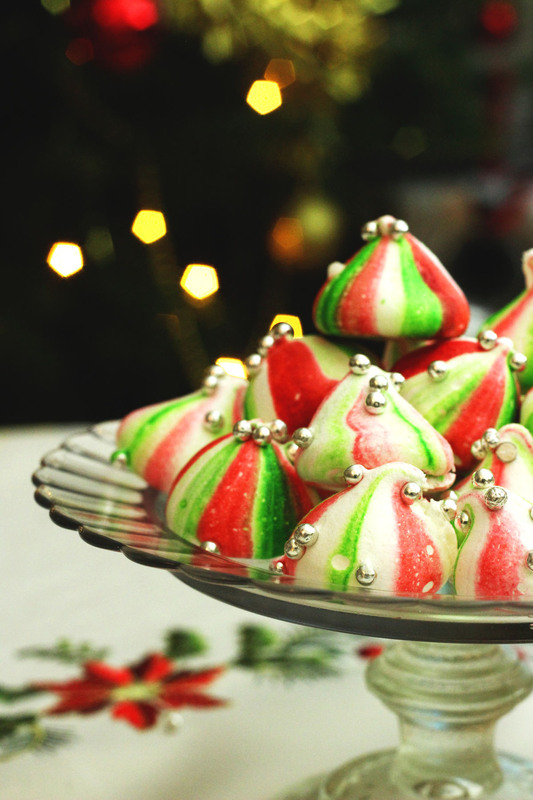 With crisp shells and soft marshmallowy centres, kids and grown-ups alike will love these festive meringue kisses. Why not try adding some of your favourite festive flavours (how about cinnamon, peppermint or chocolate? ), sprinkling with nuts or using different colours? Some of these kisses are destined for a Christmas Bake Sale, the others will find their way into a festive “Eton Mess” style dessert (watch this space). 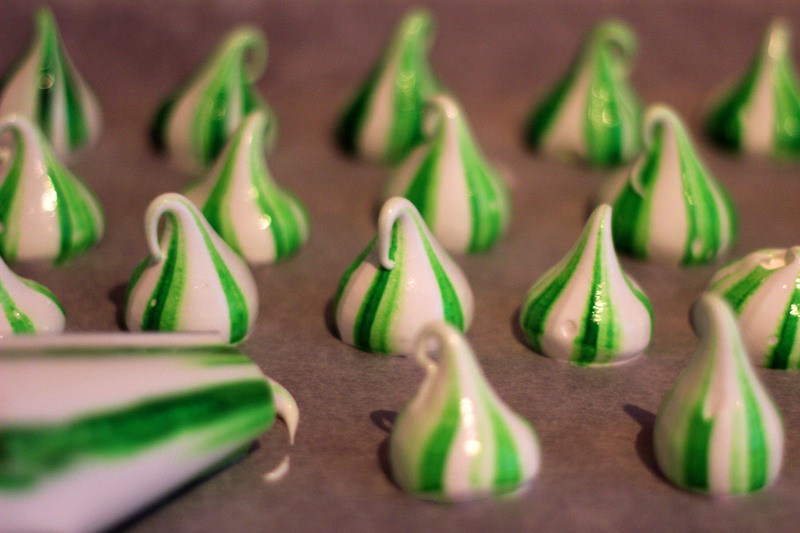 What will you do with your Christmas Elf Meringue Kisses? I’d love to see your creations! I’m entering these Christmas Elf Meringue Kisses into Festive Food Friday hosted by Kerry Cooks and Taming Twins. Click the image below to find more festive inspiration. How cute!! They are absolutely adorable. It must have been such fun cooking with the Meringue Girls, and thanks for all the great tips! These are really cute. I have never made meringue before, but this looks really easy. I bet they would make great gifts too. Thanks Dannii 🙂 I ended up selling bags of them at my works Christmas bake sale and they went down a treat! They really do make lovely gifts. These are SO adorable Emma! Thank you so much for entering them into Festive Food Friday! Thanks Kerry my pleasure, it’s a great linky! Thanks Angela! That’s really kind of you to say 🙂 I was always scared of meringue but when you know a few key pieces of advice they are super easy and come out perfect every time! Thank you for sharing this idea. I have 70 cheese cake tarts I am making for a wedding. I plan on taking orange and dark blue there sport team and weeding colors And making hearts to go on top of tart. I am struggling so much on how to decorate with out to much more cost. If you have any idea or suggestions I would appreciate it. Hi Valerie – how big are the tarts and what flavour? If they are citrusy then perhaps some candied orange peel, for berries you could top with a single berry and a sprig of mint? Chocolate would look good with some simple chocolate curls!